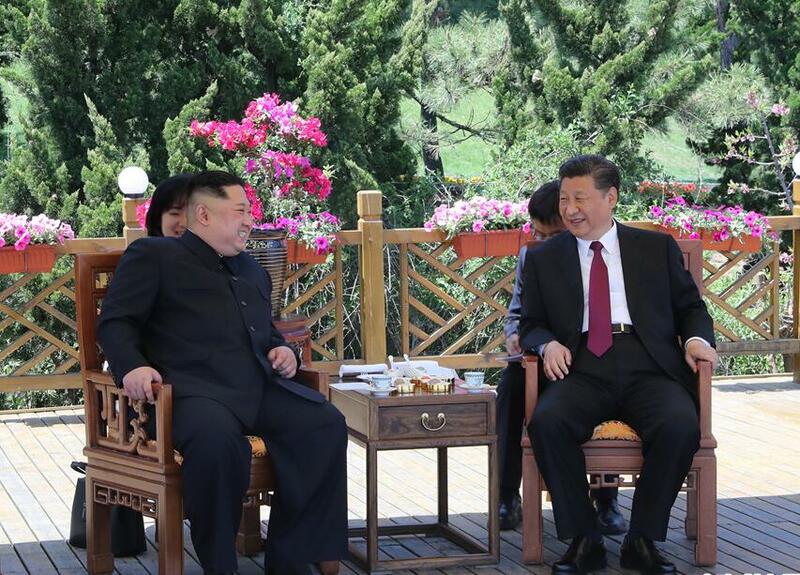 State media reported that North Korean leader Kim Jong Un and Chinese President Xi Jinping have met again. They were in the northeastern Chinese city of Dalian on Monday and Tuesday. It is the second meeting between Xi and Kim in recent weeks. Both meetings have come before the expected meeting between Kim and U.S. President Donald Trump. Neither leader spoke about the upcoming meeting with Trump or about last month's meeting between Kim and South Korean President Moon Jae-in. However, Chinese state broadcaster CCTV reported Xi as saying China "supports North Korea to stick to denuclearization of the Korean Peninsula and supports North Korea and the U.S. in solving the peninsula issue through dialogue and consultation." Kim reportedly told Xi that North Korea has no need to possess nuclear weapons if a "relevant party" drops its "hostile policy and security threats." He was reported as saying "I hope to build mutual trust with the U.S. through dialogue." Trump wrote on Twitter that he planned to speak with Xi later in the day to discuss trade and North Korea. He wrote that "relationships and trust are building." The Trump administration has demanded that North Korea immediately agree to denuclearization. The Kim-Xi meeting was the top news story in North Korea. The country's most famous television announcer Ri Chun Hui even came out of near retirement to report the event. The 20-minute report did not show any pictures or videos of the visit. It said there was a "deep exchange of opinions" between Kim and Xi on the changes around the Korean Peninsula. The report also said Kim's younger sister was with him at the meeting. CCTV's report, however, included images. It showed Xi wearing western business clothes and Kim in his traditional "Mao" clothing. The two leaders stood near the sea, sat under a covering on an outdoor area, walked through gardens and sat at a conference table. China's official Xinhua News Agency reported that, at a key time when the area situation is developing quickly, "Kim said he came to China again to meet with Xi and inform him of the situation." He spoke about preserving the country as a secular state. In our country, the reform is in the stage of storming fortifications, the development is in the key time. They walked through thick forest. 5.The country's most famous television announcer Ri Chun Hui even came out of near retirement to report the event. In a big stride he came out of the room. 6.He was reported as saying "I hope to build mutual trust with the U.S. through dialogue." Diplomats hope the meetings will build mutual trust. Mutual trust is the bedrock of a relationship.